This entry was posted on December 27, 2013 by ScanTool.net Team. As part of this offer, enjoy FREE SHIPPING to any US address! If you'd like to take advantage of these bargain-basement prices, you need to hurry -- this is truly a limited-time, while-supplies-last sale. Once this deal is gone, it's gone forever. 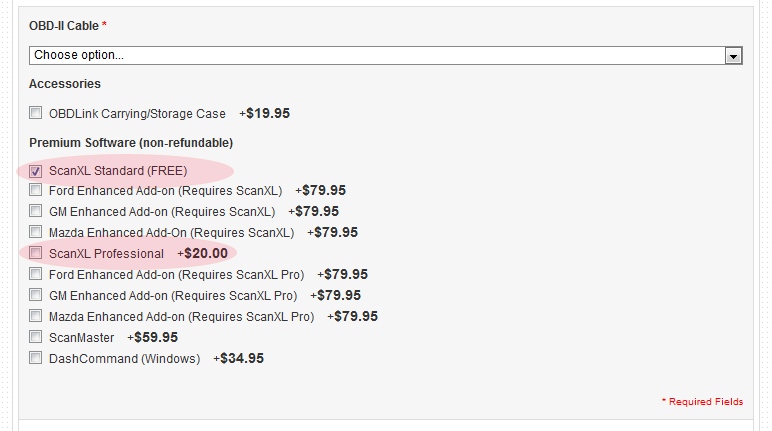 To upgrade to ScanXL Professional software, check the ScanXL Professional box instead. When checking out, you can verify that the correct software is included with your order. Launched in 2009, OBDLink quickly became a best-seller, garnering rave reviews for its superb quality, reliability, and unmatched performance. ScanTool.net continued to improve the design, and four years and sixteen hardware revisions later, it continues to offer the best value for your diagnostic dollar. As the diagnostic tool market continued to move towards mobile platforms (smart phones & tablets), we have made the decision to discontinue the production of OBDLink to focus on its successors. However, OBDLink is still one of the best ways to convert an old laptop, netbook, or a desktop PC into a sophisticated diagnostic scan tool. And, you can rest assured that your OBDLink purchase is protected by the 90-day money-back guarantee, second-to-none technical support, and industry's best 3-year "repair or replace" warranty. ScanXL is the most advanced professional OBD software available for OBDLink. It is packed with features that meet the needs of both the professional mechanic and auto enthusiast alike. Coupled with manufacturer-specific add-ons, it delivers the full range of generic diagnostics for any OBD-II compliant vehicle sold worldwide, along with providing manufacturer-enhanced diagnostics for many vehicle types. With ScanXL, you can access not only the powertrain systems, but also ABS, airbag, and other proprietary systems that would otherwise require expensive dealer tools to work with. To get dealer-level diagnostics on your laptop or PC, you need to purchase ScanXL enhanced add-ons available for Ford, GM, and Mazda vehicles.